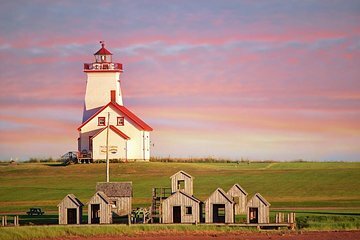 Drive by coastal cliffs and beaches, forests, rolling farmland, pastoral rivers, and the ever-present sea on this 4-hour tour of Prince Edward Island. Meet your guide midday at the Charlottetown Visitor Information Centre and board your comfy coach bus. You’ll visit two historic lighthouses, beginning with Point Prim, the first constructed on the island in 1845. Learn about the first settlers and traders who frequented this round-brick lighthouse. Next, stop by the Wood Island Lighthouse, built in 1876 to aid marine traffic in the Northumberland Strait. Snap photos of the hills before continuing to the Rossignol Estates Winery. Here, sample a variety of wines, including its double-gold-winning blueberry wine. Your tour ends with drop-off back at the departure point in the afternoon.